After Obama, I have no belief whatsoever in the integrity of any federal government agency, especialy the Department of Justice and the FBI. In short, I am not convinced that the truth has yet been told regarding the infernal devices and their creator(s) and distributor(s). I am more inclined to believe it is the invention of the same people who declared Hillary Clinton and her collagues innocent of any crimes and paid for the creation and dissemination of the Steele dossier, as well as the claim that Mitt Romney didn’t pay income taxes. I mean, forgive me but even absent the long list of outright lies that Jerry lists, there is enough in this particular case alone to raise questions about the truthfulness of what we’re being told. 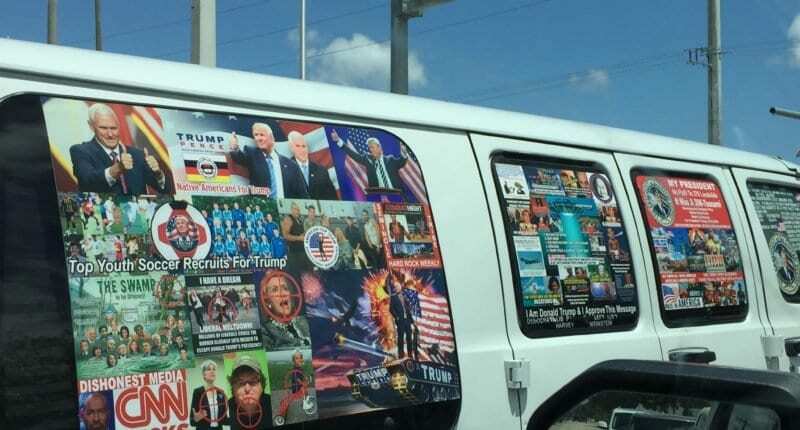 Have have a look at the van that they arrested him in. I don’t know about you but it strikes me that this is not a sign of somebody who is trying desperately to remain anonymous in the midst of a nationwide manhunt. Look at the condition of the stuff in his windows. How long do you suppose those stickers would have remained fresh and clean and unsun- bleached, in the sun of Central Florida? I’m telling you folks, I smell a cat’s paw. I been calling it Timmy 2.0 since the Feds said they had a suspect. Too many bells just don’t ring on this one, but thanks to Edward Bernays fine work they should be able to sell it. Anyone else recall the fine work the Feds did with Richard Jewel?